Although 80% of malaria occurs in children under five years of age, infants under six months of age are known to have low rates of infection and disease. It is not clear why this youngest age group is protected; possible factors include maternal antibodies, unique nutrition (breast milk), and the presence of foetal haemoglobin (HbF). This work aims to gain insight into possible mechanisms of protection, and suggest pathways for focused empirical work, by modelling a range of possible effects of foetal haemoglobin and other red blood cell (RBC) developmental changes on parasite dynamics in infants. A set of ordinary differential equations was created to investigate the leading hypotheses about the possible protective mechanisms of HbF-containing red blood cells, in particular whether HbF suppresses parasite population growth because parasite multiplication in individual RBCs is lower, slower or absent. The model also incorporated the intrinsic changes in blood volume and haematocrit that occur with age, and the possibility of parasite affinities for HbF-containing RBCs or reticulocytes. The model identified several sets of conditions in which the infant remained protected, or displayed a much slower growth of parasitaemia in the first few months of life, without any intervening immune response. The most protective of the hypothesized mechanisms would be the inhibition of schizont division in foetal RBCs so that fewer merozoites are produced. The model showed that a parasite preference for HbF-containing RBCs increases protective effects for the host, while a preference for reticulocytes has little effect. The results from this simple model of haematological changes in infants and their effects on Plasmodium falciparum infection dynamics emphasize the likely importance of HbF and RBC number as an explanatory factor in paediatric malaria, and suggest a framework for organizing related empirical research. Malaria disproportionately affects children under five years of age . 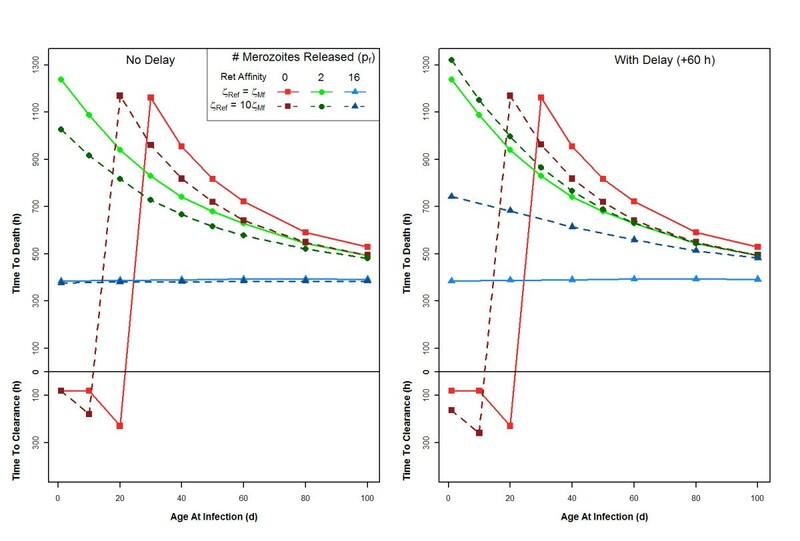 Repeated infection builds immune responses that protect against severe clinical disease and reduce parasitaemia [2–4], and, presumably, older children in endemic areas have been exposed more often and to a wider range of antigens than younger children. 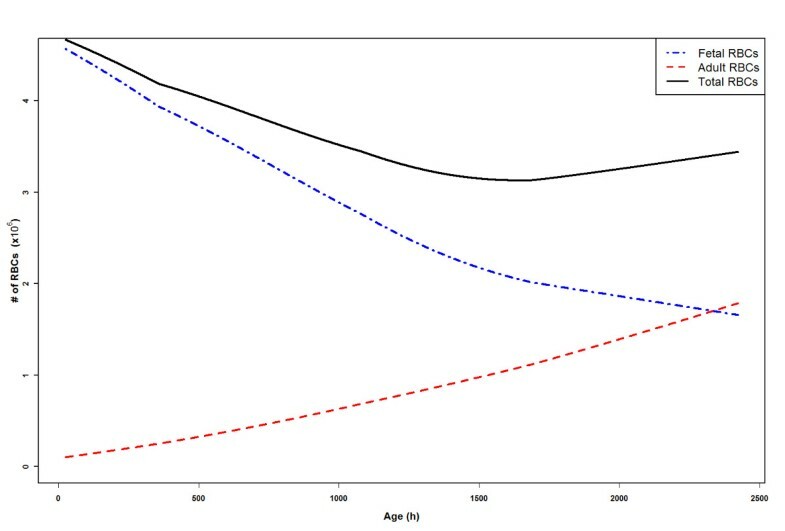 Hence age is often considered a surrogate for cumulative exposure, and age differences in response are attributed accordingly. There may be more to the explanation, however, given that intrinsic developmental differences between children under five and older children, or adults, may affect responses to malaria infection [5, 6]. Among the developmental age differences that may affect the course and outcome of a malaria infection are the age-specific abundance and properties of red blood cells (RBCs). A human malaria infection begins when the parasite enters the bloodstream in the saliva of an infectious, biting mosquito. The parasite invades the liver, multiplies there for approximately 10 days, and then releases thousands of merozoite forms into the bloodstream. Each merozoite invades a RBC, multiplies, and – if Plasmodium falciparum or Plasmodium vivax, the most common species – in about 48 hours bursts the RBC to release eight to 32 new merozoites, which invade new RBCs and continue the cycle . Virtually all of the pathology of human malaria is associated with this cycle in RBCs, which continues until the host mounts an immune response sufficient to control the infection, or the host dies. Presumably, the basic biological process of parasite invasion and multiplication in RBCs is independent of the literal age of a host (i e, the parasite does not “know” how old its host is), and so, whatever the host’s age, cycles proceed roughly as sketched above, with regular numbers of merozoites released at each cycle, in cycles of regular length. The total blood volume of a host increases very significantly with age and size [8, 9]. Therefore, all else equal, overall parasitaemia will increase more rapidly in hosts with smaller total numbers of RBCs – younger children – and the consequent anaemia will become more severe more quickly. That is, while the RBC count of 4–6 × 106 ml-1 of blood may be similar between infants and adults, the blood volume of an adult is 10–15 times that of an infant, so any given population of parasites in an adult host will represent a much lower total parasitaemia than in an infant host. Another notable difference between infants and older children is that a much higher proportion of RBCs in infants contain foetal haemoglobin (HbF) rather than adult haemoglobin (HbA). HbF is produced only in humans, apes and Old World monkeys: it has a stronger affinity for oxygen than HbA, and so facilitates oxygen transfer across the placenta from mother to foetus during gestation . Beginning in the final trimester of pregnancy, and continuing into the first months of life, haemoglobin production usually largely switches from HbF to HbA, and the fraction of RBCs that contains HbF declines accordingly. The fraction of RBCs that contains HbF at birth varies from about 50% to 100% among neonates [11, 12]. Variation may be related to differences in gestation period and/or in the complex polygenic control of haemoglobin production [13–15]. In most adults only about 1% of RBCs contain HbF, but in those with hereditary persistence of foetal haemoglobin (HPFH), a benign condition in which mutations or deletions in the β- or γ-globin genes or regulatory regions alter normal haemoglobin switching, 10-100% of RBCs contain HbF. Infants under six months of age have a low rate of infection and incidence of severe disease compared to older children , despite the relative immaturity of their immune systems. Several factors may contribute to this protection, including passively transferred maternal antibodies, unique nutrition (breast milk), and elevated HbF . Current evidence suggests that HbF retards the expansion of a Plasmodium population because Plasmodium parasites do not survive as well in HbF-containing RBCs as in those containing HbA [18–23], though details and specific mechanisms remain unclear. There could be several reasons for the retardation: the HbF cell may be a “dead end,” meaning that the parasite can invade but cannot replicate, or cannot escape, and so dies within the RBC. Alternatively, the growth process may be suppressed or slower in HbF-containing RBCs, such that fewer merozoites are released per infected RBC, or they take longer to develop to the point of bursting. In addition, P. falciparum may have a higher affinity for HbF-containing RBCs than HbA-containing RBCs. P. falciparum may also have (like P. vivax) a higher affinity for reticulocytes – the youngest age class of RBCs – which may be present in higher proportions in growing infants, and so may affect infection dynamics. In any case, the proportion of HbF-containing RBCs may be a factor in the protection of infants from severe clinical disease and high parasitaemia: by slowing parasite population growth, they may provide extra time for an effective response by the infant’s developing immune system or maternal antibodies. Although several possible factors underlying variable protection in infants have been suggested, including the effects of maternal antibodies, nutritional differences, and HbF, none has yet been confirmed. Foetal haemoglobin is one of a number of mechanisms, reviewed in an earlier paper , that could help to explain the observed neonatal protection from severe disease. Infants have immature immune systems, in which key elements are developing asynchronously , so any added protective factors are likely to be of particular importance. This is a difficult set of topics to study, however, given the age group and multiple confounding factors. 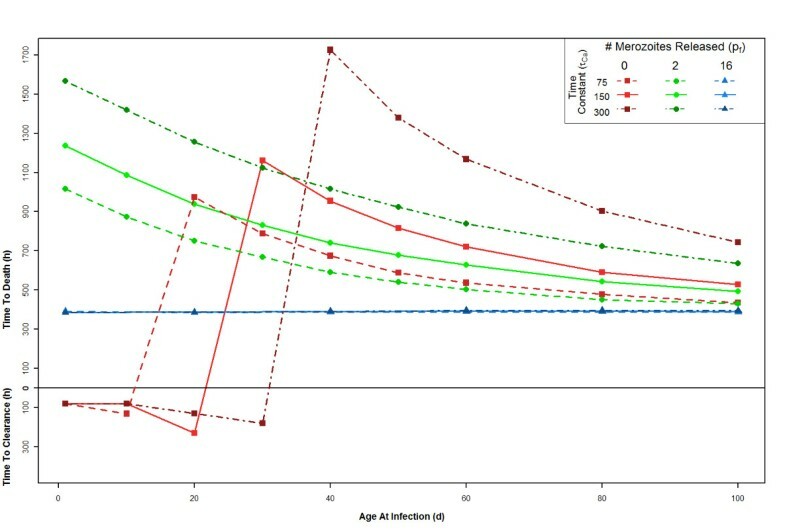 No mathematical model to date has investigated the effects of any developmental age difference on a malaria infection. Here previous models of RBC dynamics in malaria infections are extended to focus specifically on the effects of lower RBC counts and higher HbF proportions on the dynamics of P. falciparum infections in infants [24–26]. A set of ordinary differential equations (ODEs) was used to model the dynamics of circulating RBCs, including the effect of infant growth on total blood volume (via the rate of growth of erythropoietic tissue), the switch in production of HbF- to HbA-containing RBCs, and the change in haematocrit in the first few months of life. The dynamics of two RBC lines were modelled – the uninfected (1) foetal and (2) adult erythrocytes – then the dynamics of malaria infection were incorporated into the dynamics of the circulating RBCs. Three main populations of Plasmodium parasites are involved in the pathology of malaria in an infant: (1) those in infected foetal erythrocytes, (2) those in infected adult erythrocytes, and (3) free merozoites in the blood. (Gametocytes and any cryptic sexual forms were ignored in the model.) Thus, the dynamical model considered has five separate populations, describing the dynamics of uninfected and infected foetal (HbF) RBCs, uninfected and infected adult (HbA) RBCs, and free merozoites within an infant host. For conciseness, vector and matrix notation (Additional file 1) are used to describe the dynamical equations. where S(t) is greater than or equal to zero for all t, Λ > 0 and dΛ = 0. The components of the vector δ(1) are zero except for the first one. Matrix D is sparse with all diagonal components = 1, and all components just below the diagonal = −1; see Additional file 1 for details. One can show that the contribution to –dT (P)/dt from S at time t - Δt is approximately a Gaussian function of Δt with a mean D = N Λ-1 and standard deviation σ = D N-1/2[24, 27]. The ODE system described by equation (1) models the dynamics of individual organisms with total population T(P) and source term S(t). If individuals age with an average lifespan of D with standard deviation σ, then knowing the tangible quantities D and σ sets the abstract quantities N and Λ. (If D = σ, the ODE system reduces to one of simple exponential decay with a source term.) Although the vector–matrix notation is introduced for brevity, P itself can be thought of as containing all the information about the “state” of the population possible in this model. The matrix Λ D operates on the state vector P, incorporating the contribution of the source S(t) into the time evolution of P. This formalism may seem complicated initially, but it incorporates the non-instantaneous propagation of changes in the source S(t) into the population. One could think of other formalisms that incorporate time delays and dispersion in aging, but this particular one allows the use of efficient ODE solvers. In uninfected individuals, RBCs containing HbA circulate for ~120 days, while RBCs containing HbF circulate for ~70 days, at which point the RBC is cleared by the spleen . In adults, there are ~5 × 106 RBCs per μl of blood. In neonates, the haematocrit dips within the first few months of life, and then rises again to adult levels . Presumably, this transient dip is related to changes in RBC production in combination with the growing mass, and thus total blood volume, of the infant. The sum of the components of ρ, T( ρ ), is VB-1X T( P ), the density of the population in the blood. So from the point of view of population density, the growth of blood volume contributes a decay factor ΛV: a growing volume tends to dilute the concentration of cells. Note that ΛV itself is time dependent, as the rate of volume growth slows as the child ages. Here W(t) is the mass of the host at age t. The time evolution of W(t) and VB(t) is discussed in Additional file 1. The values of the parameters Pamx, tOSa, τCa, Pfmx, τCf and Pfmn are given in Table 1. Three pairs of time constants were used to model different changes in the rates of HbF and HbA production (Table 1). Using these parameters, the HbF:HbA ratio reaches 1:1 at 65, 97, and 163 days of age. Baseline parameters for adult (HbA) and foetal (HbF) RBCs . Here Vf and Va are the mean volumes of foetal and adult erythrocytes. Their values are given in Table 1. Rea and Ma are the population state vectors for the reticulocytes and mature RBCs for adult RBCs and Ref and Mf are the corresponding state vectors for the foetal RBCs; see next subsection. If the value of hc drops under 24%, it is assumed that the host dies. Here, I is the identity matrix and ESa(t) and ESf(t) are the source rates of production of adult and foetal reticulocytes, respectively, per unit volume of blood. These quantities change as the host ages, in a manner specified below. ζRea, ζMa, ζRef, and ζMf are the binding affinities of the merozoites to the respective RBCs; the values are defined in the next section. The state vector of the merozoites is μ. The rates ΛRea, ΛMa, ΛRef, ΛMf and the vector lengths were defined as in the subsection “Basic Structure of Dynamical Model” using the values specified in Table 2. Durations of intracellular parasite stages in adult (HbA) and foetal (HbF) RBCs . Merozoite duration , Adult erythrocyte durations: , Foetal erythrocyte durations . The standard deviations are plausible guesses. Five morphologically distinct populations of asexual parasite cells were considered: (1) ring stage, (2) early trophozoites, (3) late trophozoites, (4) schizonts, and (5) merozoites. The possibility is allowed that the parasite can develop in either foetal or adult erythrocytes, but possibly at different rates of development and with different efficiencies of reproduction in each type. The list of populations as well as the average durations of individual residence in those populations, along with the standard deviations in the durations, is given in Table 2. The primary release of merozoites from the liver apparently involves the release of thousands of merozoites in clusters . For simplicity it is assumed that primary release occurs over a duration τPR = 24 hr with total of 105 merozoites released into the blood volume VB at a constant rate per unit volume κPR = 105 (24 h X VB)-1. The average number of merozoites subsequently released by bursting schizonts of P. falciparum in human blood culture is known from direct microscopy to be >16 , so in this report the average number of merozoites released from a bursting schizont formed in an adult erythrocyte is taken to be pa = 16. The possibility is allowed that the average number of merozoites released from a bursting schizont formed in a foetal erythrocyte, pf, may be different from pa. The binding affinity of merozoites to target RBCs is inferred from observations of parasite growth in neurosyphilis patients treated for malaria therapy [33, 34], and inoculated volunteers , to be 10-6 – 10-5 μl hr-1. Here, ζMa, the binding affinity of a merozoite to the mature adult RBC, is taken to be 3.33333 × 10-6 μl hr-1. The possibility is allowed that the merozoite binding affinity to adult reticulocytes, ζRea, mature foetal RBCs, ζMf, and foetal reticulocytes, ζRef, may differ from ζMa. The value is only changed when directly stated. Note that since D μ = σμ, the state vector for the merozoites, μ, has only one component, so it was treated it as a scalar in equation (6). The rates Λμ, ΛRa, ΛEa, ΛLa, ΛSa, ΛRf, ΛEf, ΛLf, ΛSf and the vector lengths were defined as in the subsection “Basic Structure of Dynamical Model,” using the values specified in Table 2. For further details on the Methods, see Additional file 1. Because little is known about the protective effects of HbF at the single-RBC level, several hypotheses about the failure of P. falciparum to develop normally within an HbF-containing RBC were modelled. First, the possibility was investigated that HbF-containing RBCs release 0, 2, or 16 merozoites (pf = 0, 2, or 16), while HbA-containing RBCs always release 16 (pa = 16). Second, the rate at which infants produce HbF and HbA during the first few months of life was varied (τCf =50, 100, or 200; τCa =75, 150 or 300). Third, the possibility was examined that P. falciparum has no preferential affinity, an increased affinity for HbF-containing RBCs, or an increased affinity for reticulocytes (ζRef > ζMf and ζRea > ζMa, or ζRef > ζRea and ζMf > ζMa). Last, the possibility that in HbF-containing RBCs the schizont stage is delayed 60 h (DSf =72), (so that the life cycle is 108 h instead of 48 h), was modelled. Figure 1 shows the changing rates of parasite population growth under these sets of conditions if an infant is infected at 40 days of age, for example. 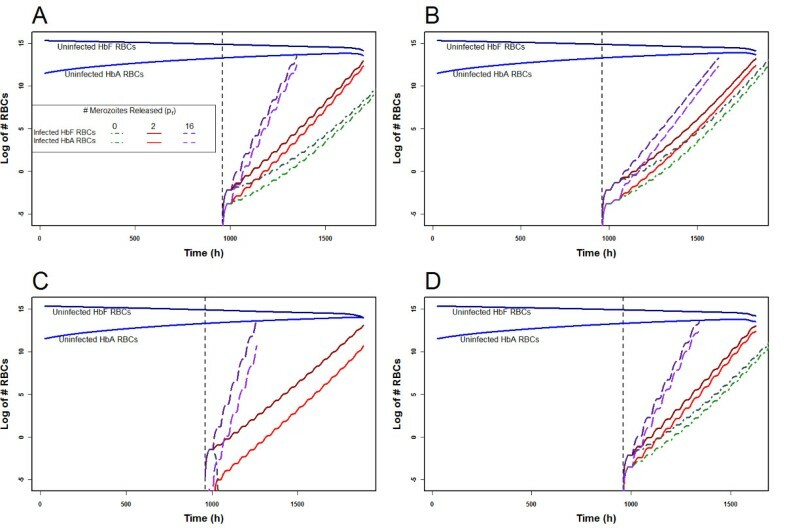 In these plots, it is clear that if HbF-containing RBCs release fewer merozoites per infected cell, the rate increases more slowly than if they release the same number as an HbA-containing cell. Adding other effects either amplifies (when pf = 0, the infection increases more slowly – graphically, a lower slope) or diminishes this effect (i e, the slope of pf = 0 and pf = 2 approaches that of pf = 16). Adding a delay is mildly protective for the host, as it slightly lowers the parasite population growth rate, which increases the time until host death. This change is seen in Figure 1B as a slightly lower slope in the number of infected RBCs. An increased affinity for HbF is very protective for the host: if an infant is infected at 40 days of age and pf = 0, for instance, as in Figure 1C, the infant actually clears the infection, rapidly. An increased affinity for reticulocytes is harmful for the host: parasite population growth increases more rapidly than if all RBCs are infected at equal rates (Figure 1D compared to Figure 1A). The number of uninfected and infected HbA- and HbF-containing RBCs (y-axis) in an infant infected at 40 days of age (x-axis: 1000 h). Each graph shows the rate of parasite population growth with pf = 0, 2, or 16. The number of uninfected RBCs is shown for pf = 2: there is no evident difference in these numbers with pf = 0 or pf = 16. A: Parameters set to values in Tables 1 and 2; B: 108 h life cycle (DSf =72); C: Parasite has a stronger affinity for HbF-containing RBCs (ζRef = 10ζRea and ζMf = 10ζMa); D: Parasite has a stronger affinity for reticulocytes (ζRef = 10ζMf and ζRea = 10ζMa). 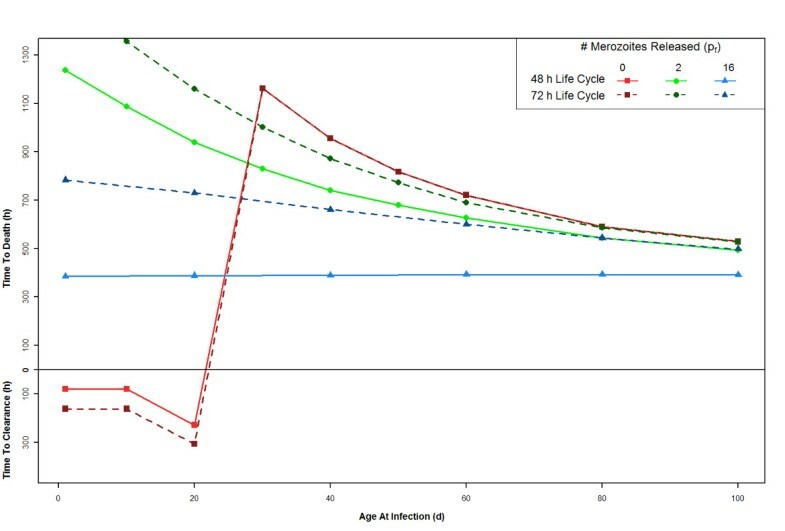 With the parameters set to the values in Tables 1 and 2, the model shows that if HbF-containing RBCs release no new merozoites (pf = 0), the infant remains protected from a fatal outcome of infection through approximately the first 15 days of life, despite the complete absence of an immune response (Figure 2; Additional file 2). If the HbF-containing RBCs release only two merozoites (pf =2), the infant dies but the time until death increases, most significantly in the first two months of life. If the HbF-containing RBCs release 16 merozoites (pf = 16), the same as HbA-containing RBCs, there is no effect; i e, this serves as a control. Now, other parameter modifications will be introduced and compared to this set of parameters. The time until the host clears infection (y-axis: below h = 0) or the host dies (above h = 0; haematocrit < 24%), when infected, occurs between one and 100 days of age (x-axis). Parameters set to values in Tables 1 and 2. Results are shown for three different values of pf, the number of merozoites released per bursting schizont in foetal RBCs. The number of merozoites released from bursting schizonts in adult RBCs, pa, is 16 for all cases. For more explanation of this figure, see Additional file 2. The rate of change of the ratio of HbF- to HbA-containing RBCs is known to vary dramatically from infant to infant. While some infants reach adult levels of HbA at three months of age, others do not reach adult levels until six months. Three different rates of change were modeled by modifying the values of τCf and τCa, such that the host reaches a HbF:HbA ratio of 1:1 at 65, 97, and 163 days of age. Figure 3 shows the rate of change of HbF- to HbA-containing RBCs when τCf = 100, and τCa = 150. Figure 4 shows the effect of these rate variations on the infection dynamics across the first 100 days of life. If HbF-containing RBCs release fewer merozoites than HbA-containing RBCs, then the infants with more HbF are more protected. Figure 4 shows that when τCf = 200 and τCa = 300 the infant is most protected from a fatal outcome. The number of circulating HbF- and HbA-containing RBCs in the model, in an uninfected infant, with parameters set to the values in Tables1and2. The effect of different rates of HbF:HbA production. Three distinct sets of parameters were used: τCf =50 and τCa =75; τCf =100 and τCa =150; or τCf =200 and τCa =300. As expected, when τCf and τCa are larger (i.e. there is more HbF for longer), the host is protected for a longer period of time. The solid lines are repeated from Figure 2 for comparison. In normal conditions, the P. falciparum life cycle within a RBC is 48 hours. It is possible that the presence of HbF delays this life cycle. A delay of 60 hours in the schizont phase of HbF-containing RBCs, leading to a total 108-hour life cycle (DSf =72) was modelled. This delay has little effect if the HbF-containing RBCs act as a “dead end” (0 merozoites released; pf = 0) for the parasite (Figure 5; also Figure 1B) compared to the normal life cycle. If pf =2, and the infant is infected at one day of age, the delay increases the time to host death by about 300 hours. This gain in time to host death slowly decreases as the age of the host at the time of infection increases. Similarly, if pf = 16 (the control) in an infant infected at one day of age, the delay increases the time to host death by 400 hours, a gain which slowly decreases as the age at infection increases. 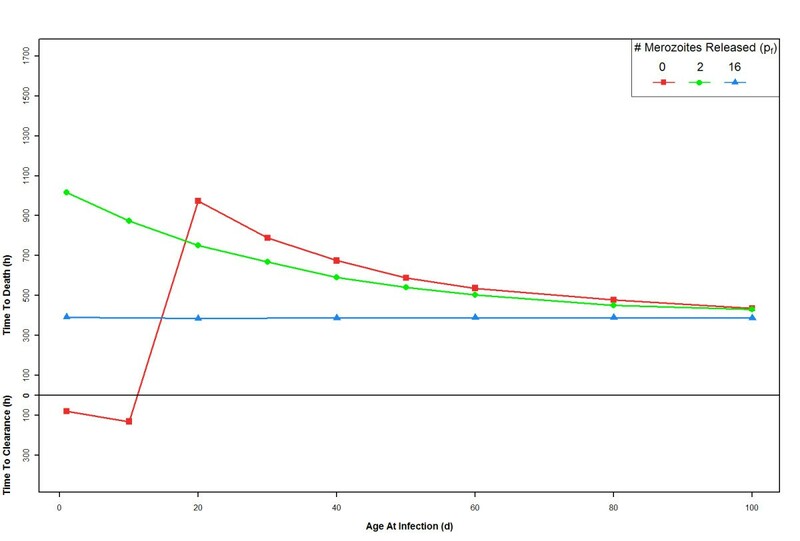 The time until the host clears infection (y-axis: below h = 0) or the host dies (above h = 0; haematocrit < 24%) when infected between one and 100 days of age (x-axis). Note that this figure contains the same plot as Figure 2, and the effect of pf = 0, 2, or 16 when there is a delayed, 108 h life cycle (ζRef = 10ζRea and ζMf = 10ζMa). Foetal haemoglobin-containing RBCs may be preferentially invaded due only to their younger age distribution, or there may be some inherent HbF-related RBC property for which P. falciparum has a greater affinity. This possibility was modelled by increasing the parasite’s affinity for HbF RBCs 10-fold (ζRef > ζRea and ζMf > ζMa). Compared to ζRef = ζRea and ζMf = ζMa, the stronger HbF affinity changes infection dynamics in favour of the host, most significantly when pf = 0 (Figure 6). Adding the 60-hour delay to this preferential binding affinity shifts infection dynamics even further in favour of the host, and makes the most significant change in time to host death from the two affinities without delay when pf = 2. The time until the host clears infection or the host dies when infected between one and 100 days of age. In this figure, the parasite has a stronger affinity for HbF-containing RBCs, and either has a normal 48 h life cycle, or a delayed 108 h life cycle (ζRef = 10ζRea and ζMf = 10ζMa). It has been reported that P. falciparum has a higher affinity for reticulocytes than for adult RBCs . This possibility was incorporated into the model by increasing the parasite’s affinity for reticulocytes by 10-fold (ζRea > ζMa and ζRef > ζMf). 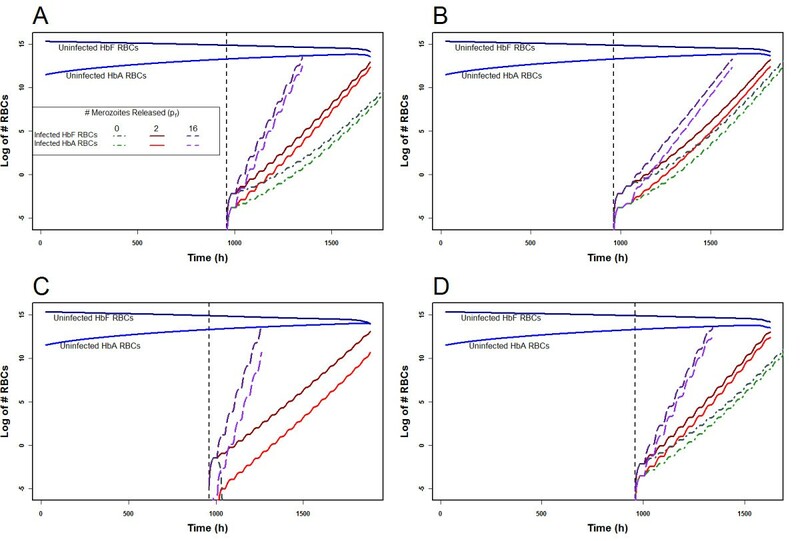 An increased preference for reticulocytes slightly changes infection dynamics, although the maximum time to host death does not decrease dramatically (Figure 7). Incorporating a 60-hour delay in merozoite release in this scenario does not appreciably change the effects from those without the delay if pf = 0 or 2. If pf = 16 (the control), in an infant infected at one day of age, the time to host death increases by 400 hours, a gain which slowly decreases as the age at infection increases. The time until the host clears infection or the host dies when infected between one and 100 days of age. In this figure, the parasite has a stronger affinity for reticulocytes, and either has a normal 48 h life cycle, or a delayed 108 h life cycle (ζRef = 10ζMf and ζRea = 10ζMa). The model presented here incorporates haematological changes that occur in infants under six months of age, and the results may offer some help toward explaining why neonates are relatively protected from severe malaria. The results are in accord with empirical studies which show that the youngest among the age group in question are protected, but the point at which the shift occurs varies based on transmission: in areas of high transmission, infants are protected only through the first three months of life, while in areas of low transmission, infants seem to be protected through six months . It is possible that in areas of high transmission, HbF-containing RBCs are destroyed more quickly as a result of infection and, therefore, the switch to HbA-containing RBCs occurs more quickly. Thus, in areas of high transmission, infants may be protected for a shorter period of time. In a study of three regions of Togo, parasitaemia prevalence increased from 18.2% in infants zero to two months, to 43.0% in infants three to five months. The prevalence of anaemia was also reported to have increased from zero to two months to three to five months of age, with “anaemia more likely in children with parasitaemia.” Overall, there was no significant difference in parasite burden in the different regions, and, in all regions, most clinical disease was observed in infants under two years of age . Another study examined infants younger than three months of age in Gabon, and found a parasite prevalence of 0.1%, concluding that parasitaemia in infants younger than three months of age is very uncommon . A study in Malawi that measured the parasitaemia of all paediatric admissions (<15 yrs) found that 4.8% of positive smears were in children <6 months and 80.7% were in children between six months and five years of age. 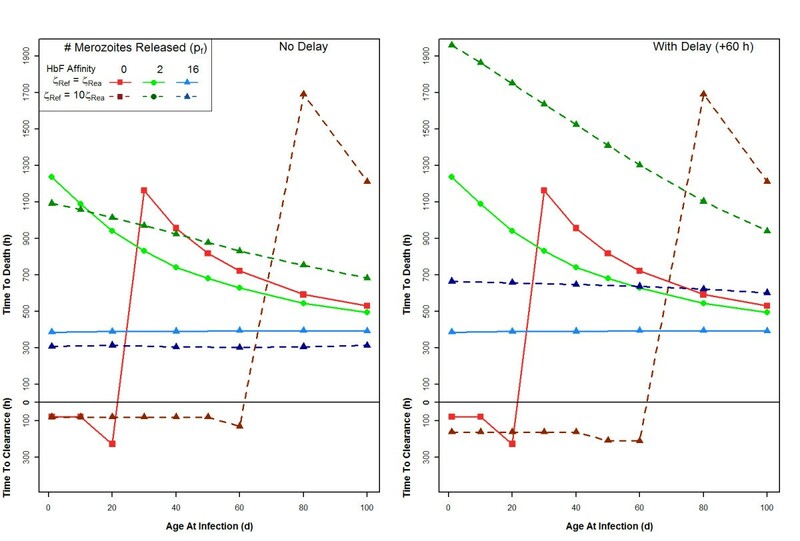 They concluded that although the risk of infection is lower in children in the younger age group than in older children, the risk does increase in early infancy and that this age group is at a greater risk for infection than previously thought . In the model, when the parameters are set as in Tables 1 and 2, if pf = 0, the host is protected for the first two months of life, despite the complete absence of an immune response. For the next few months of life, the rate at which parasitaemia increases in the course of an infection is slower than in an adult host, and this difference may be sufficient to allow for effective immune intervention: any host factor that slows down parasite population growth buys time for protective responses by maternal antibody or the developing, immature infant immune system. Whatever the mechanism by which HbF retards the expansion of a Plasmodium population – whether parasite multiplication in an individual RBC is lower, slower or absent – the presence of HbF would appear to be an unmitigated benefit to the malaria-exposed, of any age. Yet the sparse evidence suggests that HPFH is rare, in areas of high malaria endemicity as elsewhere. Sickle cell anaemia and β-thalassaemia are generally accompanied by elevated HbF levels, but the degree of elevation is highly variable [39, 40]. Because elevated HbF levels ameliorate the clinical symptoms of sickle cell disease and β-thalassaemia, and the switch from HbF to HbA production is neither complete nor irreversible, therapeutic reactivation is an active area of research : hydroxyurea is the standard agent in current clinical practice . The potential of these approaches for interventions in malaria-endemic regions apparently remains unexplored . It seems possible that there are opportunities for laboratory researchers to gain important insights from in vitro work. For instance, if sufficient quantities of HbF-containing RBCs could be obtained, and parasite cultures established in them, critical observations could be compared to those from the usual cultures of HbA-containing RBCs, on the number of merozoites released per infected HbF-containing RBC, and the time from when the parasite enters the HbF-containing RBC until it bursts. The hypothesis that HbF-containing RBCs release fewer merozoites has a greater overall effect on infection dynamics than a delay in the parasite life cycle. Empirical research suggests that the parasite may have a reticulocyte preference, and that this may confound the seeming preference for HbF in vivo through the differing age distributions of HbA- and HbF-containing RBCs . Although a reticulocyte preference seems more beneficial to parasite persistence than host survival, in combination with a reduced merozoite release the overall effect still benefits the host. It has long been accepted that children under six months of age are protected from severe infection, and this is widely reflected in the literature on paediatric malaria. This topic has recently been analysed more carefully, as noted above, and it appears that the malaria burden in this age group – while still relatively low – may be higher than previously acknowledged . It may be that age-related variation within the overall age group arises from variation in HbF levels and transmission intensity. The results from this simple model of haematological changes in infants and their effects on P. falciparum infection dynamics seem intuitively sound in a qualitative sense, and they emphasize the likely importance of HbF as an explanatory factor in paediatric malaria. The model provides a framework for examining hypotheses about the protective effects of foetal haemoglobin, organizing empirical observations and making critical quantitative comparisons among them. The research contribution of PGM was supported by the Intramural Research Program of the NIH, Center for Information Technology. EB conducted the model runs and compiled the output. All authors contributed to the development of the model and wrote, read and approved the final manuscript.